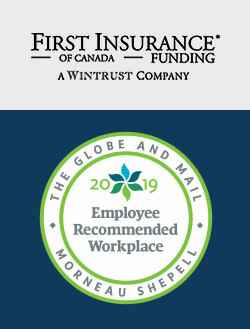 TORONTO, ON, FEB. 11, 2019/insPRESS/ – For the third consecutive year, FIRST Insurance Funding of Canada (FIRST Canada) was recognized as an Employee Recommended Workplace from human resources consulting and technology company Morneau Shepell, in association with The Globe and Mail. This recognition is based solely on employee feedback gathered from a survey that measures the total health of a workplace including physical, mental, work, and life factors. Companies are recognized as an Employee Recommended Workplace if they earn excellent scores in providing a healthy, engaged, and productive culture. FIRST Canada ranks among the top organizations in the country for strong employee satisfaction scores. The employee survey is based on Morneau Shepell’s Total Health Index (THI), a suite of analytical tools that helps organizations improve the overall health, engagement, and productivity of their workforce. FIRST Canada is proud to be recognized for creating an employee-friendly work environment with high standards. This pride is reflected in the service that FIRST Canada’s employees deliver each day. “My favourite part of my job is when I am able to help our brokers with their insurance payment needs for their clients. I am fortunate to work with such a collaborative team and great broker partners,” said Account Manager Jordan. “I have been with FIRST Canada for almost three years. I am proud to be a part of a company that recognizes the importance of creating a positive culture for their employees to thrive,” said Implementation Specialist Hilary. Contact the FIRST Canada service and support team about providing innovative payment solutions for your clients. FIRST Insurance Funding of Canada (FIRST Canada) provides the Canadian Insurance Market with comprehensive payment solutions. Brokers, MGAs, and carriers can partner with FIRST Canada and expand their offering to provide more value, choice, and convenience for all of their clients. The combined strength of FIRST Canada’s dedicated team, evolved offering, and innovative platform positions its partners to meet the demanding future of the Canadian Insurance landscape armed with market-leading solutions for success. FIRST Canada is part of Wintrust (Nasdaq: WTFC), a financial services company with more than $30 billion in assets and a part of the largest premium finance companies in North America. Follow FIRST Canada on LinkedIn and Twitter. For more about the company, visit firstinsurancefunding.ca.